Explora Patagonia actively introduces travelers to the great scenery of South America, through a well prepared exploration program. Our base is a hotel built for linking man to temporary space – present and past- and the mysteries of nature. 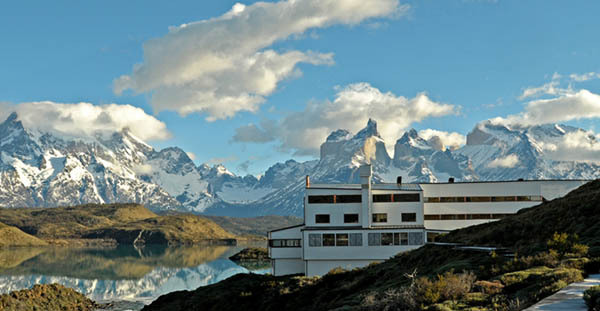 Explora Patagonia is located at the center of the Torres del Paine National Park, the heart of Patagonia, declared a UNESCO Biosphere Reserve. On the shores of Lake Pehoe, it has breathtaking views of the Paine ridge and the granite towers. Its construction is based around essential luxuries, allowing the traveler to inhabit the remote location in its essence without distractions. Wood plays a fundamental role in its design, with species such as lenga, cypress and almendrillo.Each season has its own charm, revealing new and distinct aspects of this remote place. At explora, we offer more than 50 explorations: on foot or on horse, half-day or full day, at all difficulty levels. All of our guides speak fluent Spanish and English, are very knowledgeable of their surroundings, and have the Wilderness First Responder (WFR) certification, allowing them to provide expert aid to people in remote locations. Every evening at the hotel bar, our guides meet up with guests to program the next day’s activities. Our explorations are carried out in groups of no more than 8 people.